Dura-Trac Flooring, a leading provider of temporary flooring designed for special events, has opened a new facility in the Burr Business Park in Kearneysville, W.Va.
Local elected officials, economic development officials, and members of the Jefferson County business community join Mark and Marci Cerasi, owners of Dura-Trac Flooring, LTD, for a ribbon cutting. "We're pleased to be here in Jefferson County and appreciate the assistance that we have received from everyone at the county and state level." Dura-Trac Flooring, a leading provider of temporary flooring designed for special events, has opened a new facility in the Burr Business Park in Kearneysville. The new building provides space for the company’s sales and warehousing operations as well as ancillary manufacturing needs. 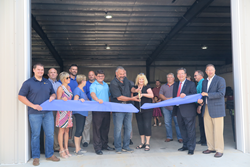 Local elected officials, economic development officials, and members of the Jefferson County business community joined Mark and Marci Cerasi, owners of Dura-Trac Flooring, LTD, for a ribbon cutting ceremony and tours of the 10,000-square-foot facility Wednesday. Currently, the company employs 10 people in Jefferson County. Dura-Trac floors are used at large-scale, special events such as concerts, conventions, graduations, sporting events, etc., in the United States, Canada, and Mexico. Some of the notable events where the flooring has been temporarily erected include concerts and gatherings on the National Mall in Washington, D.C., White House events, and PGA tournaments. The flooring is being used at this year’s Democratic National Convention in Philadelphia later this month. Started in 2004, Dura-Trac Flooring, LTD, is a global leader in temporary flooring and outdoor flooring designed specifically for the special events industry. Using a proprietary slide and lock system, Dura-Trac floors are built for speed and ease of installation.